"Great bedside manner and very attentive and competent staff!" "Awesome doctor along with his nurses and staff. Highly recommend him." "Dr. Martin is warm and caring, as well as knowledgeable in his profession." "Dr. Martin seems to really care and definitely took time to listen." "So grateful for a compassionate, caring, knowledgeable doctor. Excellent care!" "Explained procedure clearly before it was done. Procedure went exactly as described." "I recommend Dr. Martin. The staff was very nice and the facility was very clean." "On time, thorough exam, answered all my questions." 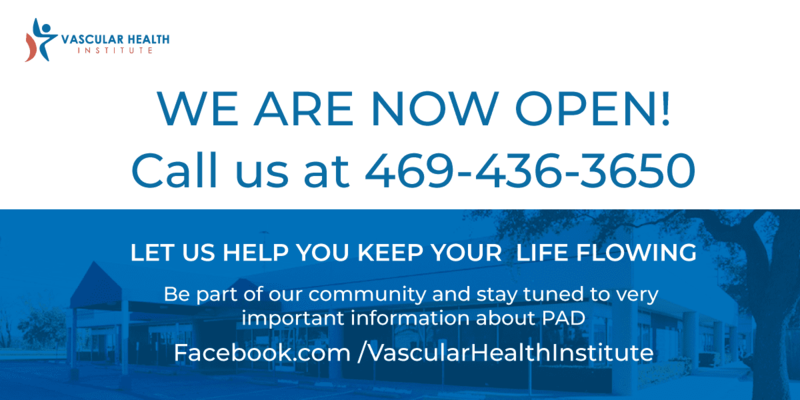 Vascular Health Institute (VHI) is an office-based procedure center located at 12610 East Northwest Highway, Dallas, TX 75228. We are very easy to find near the intersection of Northwest Highway and I635. Our physicians are among the most experienced in the country. We are dedicated to serving patients in our comfortable, conveniently located office. We endeavor to assure that patients will have a positive experience, easy access to care, safe treatment, information and support for a healthier life, and outstanding service. Most procedures are performed in a couple of hours, allowing patients to go home the same day. Each procedure is different, and so our staff is happy to help you plan for your visit with us, respond to your questions, and support you as you regain your health and mobility. We are committed to you and your good health and look forward to participating in your healthcare. We are here to help you Get Better. Vascular Health Institute currently accepts the following insurance carriers. Should you be tested for Peripheral artery disease? "Great experience with Dr. Martin. Dr. Martin performed a quick pain free procedure. The wait time was very short. Nurses and staff are great. Highly recommended!" "I strongly recommend Dr. Martin to other patients. He has shown excellent expertise and has made me feel cared for. I obtained excellent treatment." "He was great and very understanding and explained everything. I would definitely use him and his staff again if and when I ever need to." "Dr. Martin performed a four injection stem cell injection to my lumbar lower back. Five days after Dr. Martin's procedure l stared feeling much better." "Dr. Martin is everything you want in a physician. His staff is incredibly nice, friendly, and knowledgeable." "Dr. Martin and his team are a very professional group. I went in with lower back pain and the next day I had no pain. I recommend this doctor." "My mom is 88 and has dementia. Dr. Martin and his staff were so patient and considerate. He was thorough with exam and made sure to clearly explain his plan of care." "Very pleased with my experience with Dr. Martin. Great bedside manner! Took the time to answer all questions and concerns."